Phelps Helps’ Mentoring Program provides an opportunity for local high school and elementary students to build a relationship, mentors gain leadership skills while mentees build confidence in their transition to high school. It also provides opportunities for students to try something new; tapping into a skill or passion they may not know they had! 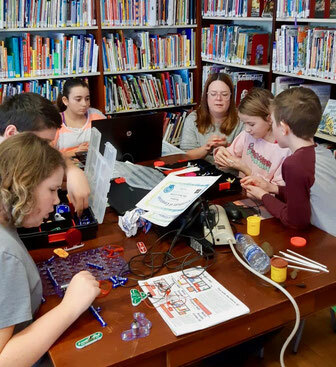 This past weekend, the Mentoring Program partnered with the Code Club at Haskell Library to expose the high school mentors and elementary mentees to a new skill: computer coding. Computer coding is the process of using algorithms to have a computer perform a specific task. With technology advancing everyday, careers in computer coding/programming are becoming increasingly in demand. This opportunity opened the student's eyes to the field and an educational path in computer science. We would like to thank the Haskell Library and Sydney for animating this workshop. The students were engaged and were surprised in their own abilities. With the start of a new year, Phelps looking for new volunteers for our weekly sessions (Tuesday, Wednesday, Thursday afternoons). Volunteering with Phelps Helps does not mean being an expert in any specific subject. Our volunteers play sports with elementary students, support elementary and high school student learning and act as positive role models. If you have a willingness to create a positive relationship with a local youth, Phelps will provide all the training you need to feel confident in your role. Sign up as a volunteer today by contacting our Volunteer Coordinator, Clea Corman, by email ccorman@phelpshelps.ca or call 819-704-0799.